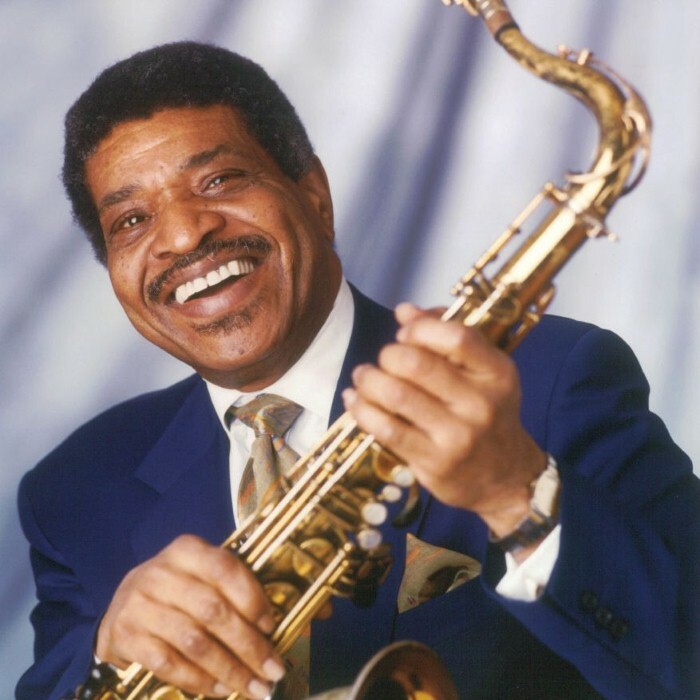 George Edward Coleman (born March 8, 1935) is an American hard bop saxophonist, bandleader, and composer, known chiefly for his work with Miles Davis and Herbie Hancock in the 1960s. He was named a National Endowment for the Arts Jazz Master for 2015. Coleman was born in Memphis, Tennessee. He was taught how to play the alto saxophone in his teens by his older brother Lucian Adams, inspired (like many jazz musicians of his generation) by Charlie Parker. Among his schoolmates were Harold Mabern, Booker Little, Frank Strozier, Hank Crawford, and Charles Lloyd. After working with Ray Charles, Coleman started working with B.B. King in 1953, at which point he switched to tenor saxophone. In 1956 Coleman moved to Chicago, along with Booker Little, where he worked with Gene Ammons and Johnny Griffin before joining Max Roach's quintet 1958–1959. Coleman recorded with organist Jimmy Smith's Houseparty (1957), with Lee Morgan, Curtis Fuller, Kenny Burrell, and Donald Bailey. Moving to New York with Max Roach in that year, he went on to play with Slide Hampton (1959–1962), Ron Carter, Jimmy Cobb, and Wild Bill Davis (1962), before joining Miles Davis's quintet in 1963–1964. His albums with Davis (and the rhythm section of Herbie Hancock (piano), Ron Carter (bass), and Tony Williams (drums)) are Seven Steps to Heaven (1963), A Rare Home Town Appearance (1963), Côte Blues (1963), In Europe (1963), My Funny Valentine (1964) and Four & More, both live recordings of a concert in Lincoln Center for the Performing Arts in New York in February 1964. Shortly after this concert, Coleman was replaced by Wayne Shorter. He played with Lionel Hampton (1965–1966), also in 1965 and performed on Chet Baker's The Prestige Sessions, with Kirk Lightsey, Herman Wright and Roy Brooks. Charles Mingus (1977–1978), Shirley Scott (1972), Clark Terry, Horace Silver, Elvin Jones (1968), Cedar Walton (1975), Ahmad Jamal (1994, 2000), and many others. Coleman also appeared in the film Freejack (1992), the science-fiction film with Emilio Estevez, Mick Jagger, and Anthony Hopkins; and 1996’s The Preacher's Wife with Denzel Washington and Whitney Houston. Coleman recorded into the 2000s. His CD as co-leader, Four Generations of Miles: A Live Tribute to Miles, with bassist Ron Carter, drummer Jimmy Cobb and guitarist Mike Stern was released on Chesky Records in October 2002 and it concentrates almost exclusively on the 1950s repertoire of Miles Davis. Tracks include: "There Is No Greater Love," "All Blues," "On Green Dolphin Street," "Blue in Green," "81," "Freddie Freeloader," "My Funny Valentine," "If I Were a Bell," and "Oleo." He was featured on Joey DeFrancesco's 2006 release Organic Vibes, along with vibraphonist Bobby Hutcherson, Billboard's Top Jazz Album, peaked to No. 17.